If it's mid-July then as sure as night follows day a paddle steamer full of Kowloon jazz fanatics sets sail for the northeast coast of England. Alright, they fly in, get along to every New Orleans/Dixieland session going then head home, 'home' is the Far East for Colin Aitchison, Franco Valussi and Neville Sarony together with family and friends. On this session at Cullercoats Crescent Club, the China Coast Jazzmen were joined by Don Armstrong, another ex-pat making a long journey, all the way from Oz. 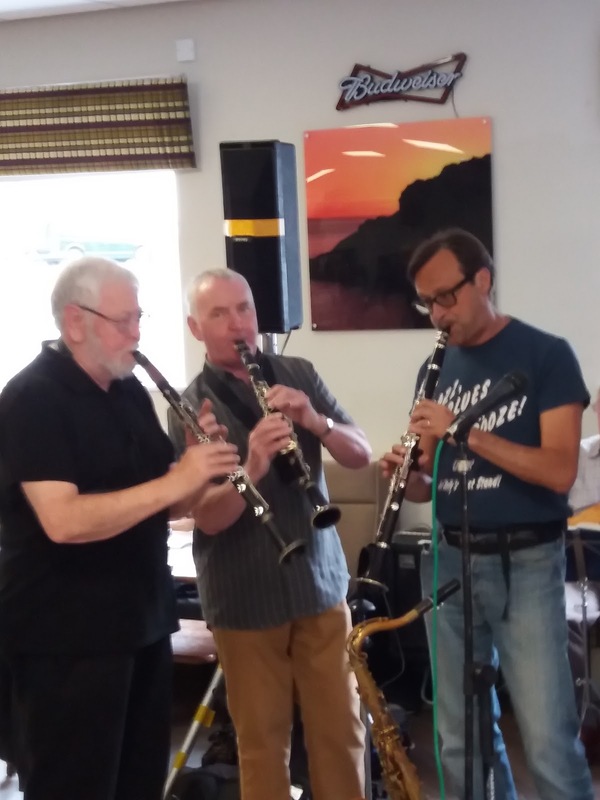 Wednesdays at Cullercoats is, of course, the Vieux Carré Jazzmen's regular gig. 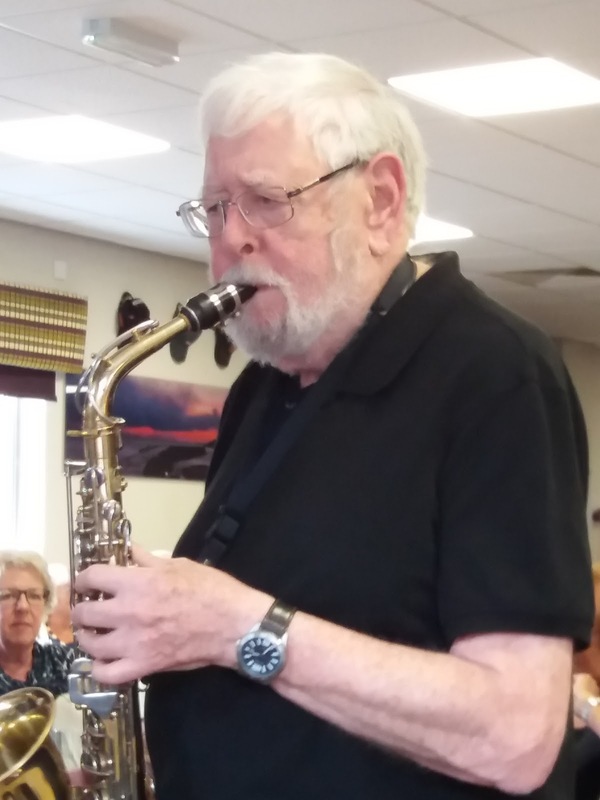 A bumper crowd turned out to listen to Brian Bennett's popular six-piece band and a dizzying number of guests. Way Down Yonder in New Orleans, A Smo-o-o-oth One, Bye Bye Blues - three tunes to get things started, Fred Thompson taking the vocal on the first of them. Band leader Bennett was keen to keep things moving, quite rightly, as it looked like being a busy one. The China Coast's ebullient vocalist Neville Sarony pitched in with Nobody Knows You When You're Down and Out, staying on the stand to sing Bourbon Street with the band parading around the room. There is never a brolly dolly when you need one! 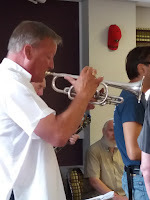 trumpeter Aitchison made an appearance. Bring Me Sunshine sang Our Man from Hong Kong, sounding fine but still not looking so good! Cullercoats regular John Broddle joined the party to croon If I Had You accompanied by Don Armstrong on alto who threw in a few quotes including Bird and You and the Night and the Music. The one time River City Jazzman Gordon Solomon added a touch of class...two trombones - Solomon and band mainstay Lawrence McBriarty, three clarinets - McBriarty J, Armstrong and Valussi, the rhythm section boys - Bill Colledge, bass and Fred Thompson, drums - had seen it all before. Three o'clock approached, time for trumpeters Bob Wade and a still suffering (!) Colin Aitchison to have a blow on At the Jazz Band Ball. Band leader Bennett looked like he was trying to herd twelve (jazz) cats as he some how managed to assemble all of them on the stand to say goodbye 'til next time. It had been quite a session.